Saint Andrew’s offers year-round private instruction and an annual Summer Music Academy for students in grades K-12. Please read the Student Handbook for information regarding lesson registration and policies. To register online, click here. Students and/or their legal guardians can make a payment online to Saint Andrew’s Conservatory of Music. Click on the link below to pay online. Interested in playing in an ensemble this summer? View the flyer below for information about our offerings. Saint Andrew’s offers a Church Music Certificate. 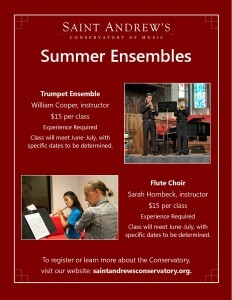 For all instructors, classes and events, contact the conservatory to inquire about schedule and availability.